We have been making mini Christmas stockings for the troops over at Ravelry. We are in the middle of a stocking-along at the Good Things Together group. 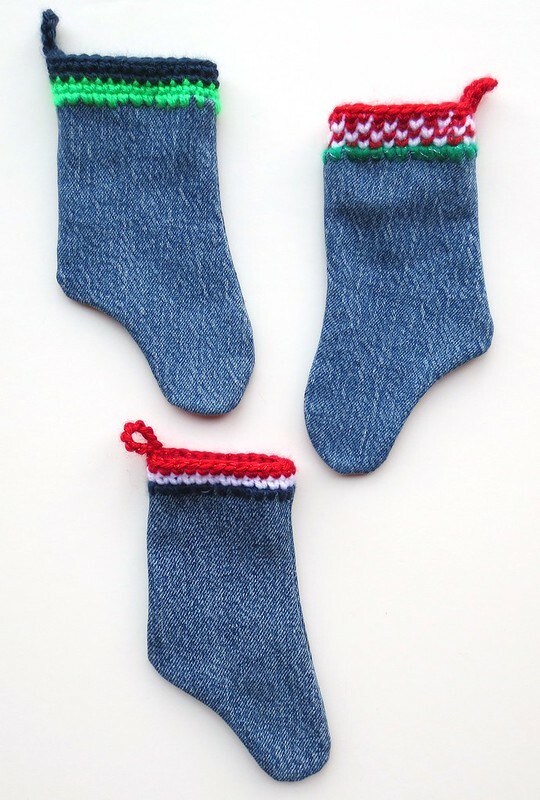 I haven’t made any recycled denim stockings this year and figured it was time. So I broke out the sewing machine and stitched up 3 denim stocking shells. I added crocheted tops to each of the 3 denim stockings. Here are the final results. The stocking-along is for mini Christmas stockings that will be sent to the Warmth for Warriors organization. Each year people handcraft the little stockings and then they are filled with small goodies and shipped off to the troops. Last year over 1900 mini stockings filled with soaps, toiletries, and candies were sent to our troops as a little Christmas gifts. The handmade stockings filled with goodies are a wonderful way to say thank you to our troops and give them a little Christmas cheer during the holidays.